Vitiligo is an acquired skin disorder characterized clinically by totally white macules, or "spots," and microscopically by the total absence of pigment producing cells in the skin called melanocytes. Both predisposing (genetic) and precipitating (environmental) factors contribute to vitiligo. 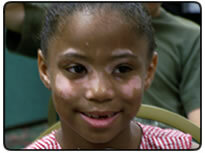 Many patients attribute the onset of their vitiligo to physical trauma, illness, or emotional stress. Onset following the death of a relative or after severe physical injury is often mentioned. Even sunburn reaction may precipitate vitiligo. The typical vitiligo macule is chalk white in color, has convex margins (as if the white areas were flowing into normally pigmented skin), is 5mm to 5cm or more in diameter, and is round, oval, or elongated in shape. Linear or artifactual macules represent the isomorphic or "Koebner" phenomenon, following repeated trauma or pressure on the elbows, knees, and bony prominences. The disease progresses by gradual enlargement of individual macules and the development of new white spots on various parts of the body. Vitiligo can be categorized as one of three types, based on the pattern of depigmentation. The most common type is generalized vitiligo, in which there is widespread distribution of white macules, often in a remarkably symmetrical array. The focal type is characterized by one or more macules on a single site; in some cases, this may be an early evolutionary stage of one of the other forms of the disease. Typical macules occur in the fingers, elbows, knees, lower back, and genital area. Extensive generalized vitiligo may leave only a few normally pigmented macules, a form of the disease referred to as "vitiligo universalis". The segmental type, which is uncommon, is characterized by one of several macules on one hand or one side of the body. This type is not usually associated with vitiligo macules in other parts of the body, and new vitiligo spots do not appear. The diagnosis of vitiligo can usually be made on clinical examination of a patient with progressive, acquired, chalk-white macules in typical sites. Few conditions are as patterned and symmetrical as vitiligo. Sometimes the spots match on both extremities in a mirror-image. Vitiligo may be associated with thyroid disease (up to 30%, especially women), diabetes mellitus (probably less than 5%), pernicious anemia (increased risk), Addison's Disease (increased risk), and multiple endocrinopathy syndrome. Associated cutaneous conditions include white hair and prematurely grey hair, alopecia areata, and halo nevi. There is no increased risk for malignancy. Skin cancers (all types) appear to be unusual. Treatment of vitiligo-associated disease (for example, thyroid disease) does not produce a return of pigment in areas discolored by vitiligo.